Although it is a dentist’s priority to always save a tooth, it often becomes important to extract the tooth. One of the primary concerns when considering tooth extraction is the pain connected with the procedure while in the clinic. To reduce the maximum pain and discomfort arising from this procedure we provide Sedation Dentistry for extracting the tooth and carrying other dental procedure at the demand of our patients. WHEN SHOULD A TOOTH EXTRACTION BE AN OPTION? A dentist or an orthodontist may choose to extract a tooth for several reasons. The tooth might be so badly damaged from either decay that it is not possible to save it even with the help of root canal therapy. It may also be creating crowding or malocclusion (bad bite) that prevent a new tooth from coming out. Or, there may be a loose tooth as a result of gum disease or due to an accident. In the simple procedure for tooth extraction, a dentist holds the tooth with forceps and moves it back and forth for making it loose from the bone. Removing the overlying gum could be necessary if a tooth is not completely through the gum. After the process of tooth extraction, the formation of blood clot takes place where the tooth had been. It is necessary not to remove the clot as it helps in healing. Disrupting the clot can lead to a dry socket, which is a painful condition that cannot heal by itself. Some light bleeding and swelling may be present over the next 24 hours. WHAT ARE THE OUTCOMES OF TOOTH EXTRACTION? A missing tooth can leave a big gap, which is enough for the shifting of the other teeth. You can also face difficulty chewing and may encounter problems with a bad bite. These difficulties can be mitigated with dental implants, dentures or bridges. 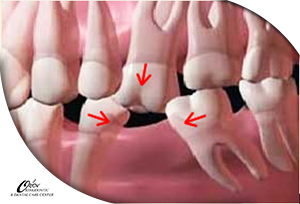 1- Wisdom teeth or the third molars are quite impacted teeth. Wisdom teeth generally begin to come in between the 17 and 21 years of age. These teeth are also known as third molars. They are the ones to get affected as your mouth does not have enough space for them. A wisdom tooth can also come in sideways, which means it can be tilted in your jaw. 3- Impacted teeth tend to suffer from cavities. 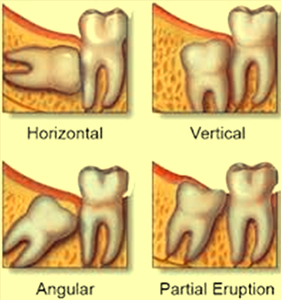 An impacted tooth generally pushes on to the neighboring molar. This can result in movement of teeth, decaying or gum disease. It also can alter the way your teeth come together. Unusually impacted teeth can result in cysts or other growths in the jaw. Pain can stay on for several days and then leave. It can, however, come back weeks or months later. At Orion dental clinic, located in South Delhi, GK 1 area we make use of digital dental X-rays which is very helpful in diagnosing an impacted tooth. You can either get relieved from this condition of minor irritation by rinsing your mouth with warm salt water (1/2 teaspoon salt in 8 ounces of water). Over-the-counter analgesics also may help. If the pain continues then is infected or is interfering with adjacent teeth, the usual treatment consists of taking it out. At this dental care center, appropriate measures are taken for ensuring the painless removal of a wisdom tooth This procedure generally takes around 15-30 minutes. Our surgeon performs a surgery that is done under local anesthesia and is thus painless, and certainly, easy post-operative guidance is given to you. After completion of the surgery, you might have slight swelling of the jaw and cheeks. Hard foods are best dodged. Prophylactic Wisdom tooth removal: We also are involved in performing the prophylactic removal of wisdom teeth. This surgery can be done before the onset of wisdom teeth in your mouth. This averts future troubles. The procedure remains the same, except for the fact that discomfort is much lesser. It is often advised to have your wisdom teeth extracted before age 21. The surgery usually is less complicated. The tissue and bone also heal better. You need to bite on the cotton wool pack given for 10-20 minutes. If bleeding occurs again then use spare cotton or a handkerchief rolled, now bite firmly in the extraction area. patiently wait for bleeding to stop. Avoid rinsing your mouth for 24 hours as this can cause a loss of the blood clot from the tooth socket and increases your chance of infection. After 24 hours of extraction, you can rinse your mouth with warm salty water only four times a day, for a week. This also aids in reducing the chances of infection. If you need painkillers like paracetamol and Ibuprofen you can take them to lessen, the symptoms and make them less severe. For certain methods, it is normal to have slight swelling and bruising after the process. Anti-inflammatory drugs can be of great help to relieve these symptoms. After the extraction, the tooth socket heals and changes shape until it is smooth in a period of 3-6 months. If symptoms stay on for several days after the extraction procedure, please feel free to contact the Orion orthodontic and dental care center. The clinic is located centrally in South Delhi at gk1 and is easily approachable both by road and metro.